What a joy! The tape and text are just fabulous. I've been listening to the songs over and over again in my car and can now sing along with almost all of them. I feel certain that that is exactly what will happen to all the youngsters who hear these magical melodies. What is very appealing is the use of children's voices. They add a dramatic touch to the songs and help to move the narrative along. Embedded within all of them (the songs) is a strong sense of values — love of the Earth, friendship, belonging, freedom, fidelity, and selflessness. The story itself will be very attractive to children. All in all, I found it to be a truly imaginative and endearing story and one which I am sure will quickly become a 'classic.' The writing is strong and authentic and will appeal on many levels. 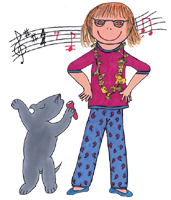 Mandy's Menagerie is a delightful collection of sweet songs sung by children that will soothe the ears and remain in the hearts of both kids and parents alike. 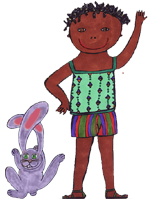 Combining an exotic locale, a little girl that anyone can relate to and a cast of lovable, quirky creatures - it's a keeper for any child's audio library. When my three-year-old likes a CD, she demands to hear it again and again and AGAIN. In the case of Mandy's Menagerie, I'm always happy to oblige. I love every song — the melodies and the message — and before long my daughter and I are both on our feet, dancing and singing and grabbing stuffed animals from her basket to act out the lyrics. The CD gives us ideas for a whole afternoon of imagination play, while my seven-month-old claps along to the sights and sounds! Thank you, Mandy.